Personal Training ...and much more.. If you’re looking to get fit AND have lots of fun, you’re on the right page. Hello. My name is Melanie and I run Movement Junkie, offering a fabulous range of dance fitness classes to make you laugh, smile, lift your spirits and all those other wonderful, joyful things that dance brings to our lives. Above all, I aim to make you MOVE and get addicted to my classes – hence my business name! Never learnt dance skills before? Don’t worry. I make a special fuss of beginners and I cater for all levels. You’ll be picking up my routines in no time and you’ll be having so much fun you won’t even remember that you’re exercising. My classes include Dance Groove , Dance Yoga , Dance Fusion , Samba Fusion and Pole Power Fitness. 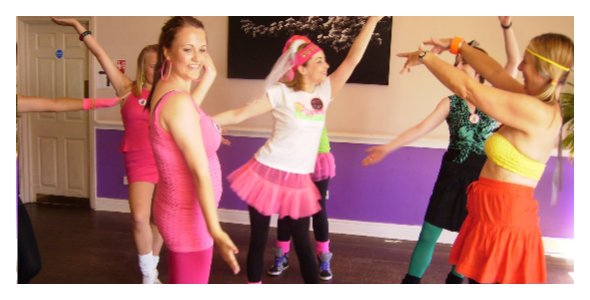 That’s not all: I also offer themed dance classes sessions for your Hen Party or fun night out with the girls. If you’d like to learn to strut your stuff like Sandy from Grease, if you “wanna live forever” (from Fame), or learn a Cheerleader routine – complete with pompoms – give me a call. Burlesque? Bollywood? Would you like to be a Flapper for the night and learn the Charleston? Movement Junkie is the place to be. I’ll devise a routine for you and your friends and you’ll remember the experience for ever. If you’d like more of a one-to-one focus in your fitness goals,, why not contact me about my personal training services? I treat the whole person, so to speak, so we’ll look at nutrition, lifestyle and other factors, enabling me to tailor a programme just for you. Feel free to look around my site, check out my class timetable and even better, contact me for more information. I can’t wait to meet you and to start turning you into a Movement Junkie.